The idea that the debate about racial vilification laws are locked in a fight over ‘political censorship’ and the right of Australians to ‘express a political opinion’ is part of a rhetorical flourish that has allowed the Coalition government to successfully capture progressives of a more libertarian ilk. What is really happening is that racial vilification reforms will make the biggest and nastiest opinion-makers less accountable. I want to explore this proposition in this post. If you missed Lateline Friday week, the new Human Rights Commissioner Tim Wilson faced off against Jeremy Jones from the Australia, Israel and Jewish Affairs Council about the proposed abandonment of racial vilification provisions, contained in section 18C & 18D of the Racial Discrimination Act 1975 (Cwth). The debate was insightful for a number of reasons. Firstly, the points of delineation became clear very quickly. On one hand, Jones referred to s18C cases to argue that the law had both been judiciously applied and was often the only provision ameliorating harmful untruths directed against ethnic and racial minority groups. Wilson argued that s18C fundamentally intruded on the right to free speech, and if there was a line in the sand it was out towards ‘incitement to violence’. Secondly, both portrayed Holocaust deniers as idiots. But where Wilson stated that Australians should be sufficiently informed to discredit such views on their own merit, Jones stated that this was not always a given, and that vilification laws were necessary to prove a case according to the facts. Thirdly, Wilson dismissed any kind of compromise around s18C. He condemned changes to the Criminal Code flagged by the Coalition Attorney-General George Brandis to criminalise aspects of vilification such as racial “intimidation” while pulling back s18C. Notably, Wilson’s is not the only one within conservative circles with such a view, Institute of Public Affairs (IPA) executive director John Roskam said he would rather there were no changes to the law than a new criminal ban on hate speech. The media, both conservative and progressive, are depicting clear lines in the sand. 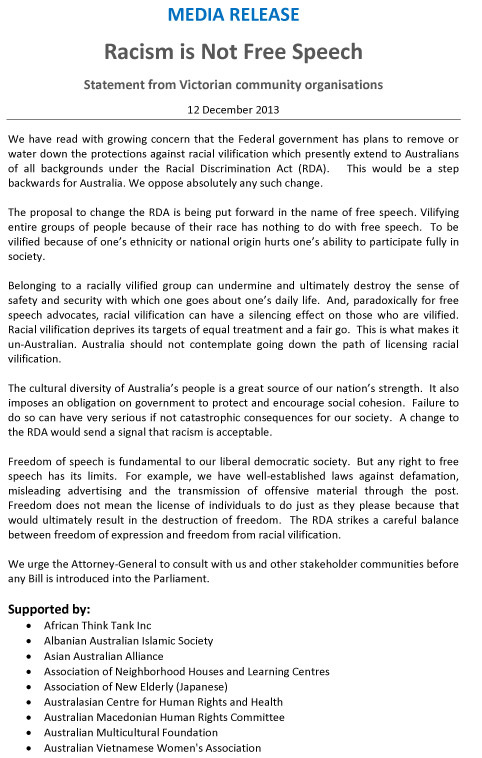 On one side, Labor and the Greens have lined up with community-driven campaigns by Aboriginal and Torres Strait Islander, ethnic and civic organisations to defend freedom from racial vilification (see here and here), on the other we have a coterie of connected, influential men bringing down s18C on the basis of the defence of free speech, and seeking to steamroll attempts to ensure public expressions of racial intimidation are consider unlawful. To portray this as where the battle-lines lie, however, is still a bit of a disservice. A quick sum up of Coalition’s perspectives. Before and directly after the election George Brandis flagged reform of s18C. When he was Shadow A-G, Brandis wrote that “Section 18C, as presently worded, has no place in a society that values freedom of expression and democratic governance” and that the provision “in its present form should be repealed”. The Coalition went to the 2013 election with a policy of removing s18C. Brandis has since mentioned potential changes to simultaneously remove s18C and introduce provisions that make the ‘intimidation’ aspects of vilification criminal. For PM Tony Abbott, following the Bolt case he stated “we will repeal section 18C of the Racial Discrimination Act, at least in its current form”, but had tempered this with a strengthening of the Criminal Code at least on one occasion. Leading into this week, views about the right approach within the Liberal Party appear divided. Craig Laundy, the new Liberal member of the Federal seat of Reid, is opposed to changes to the Act. In the Coalition party room, Ken Wyatt, the first Aboriginal Liberal House of Reps MP, said he would cross the floor on the matter, supported by another Liberal MP Ewen Jones. Phillip Ruddock allegedly called for the Coalition to maintain a position against racial vilification. Liberal MP David Coleman called for a compromise on racial vilification in the “public interest”. Mackay MP George Christensen demanded the government deliver on its commitment to scrap the laws. The details for changes to the Code are not clear. This was not clarified by the PM in question time last night. The detail is certainly not public, as shadow A-G Mark Dreyfus has rightfully criticised, and one may wonder if they exist. If it is being negotiated behind closed doors, there is a different kind of disservice being accomplished, as changes to racial vilification provisions impact vastly more people than the parties who are currently in the A-G’s court. The public deserves to know. Are the reforms really about freedom of speech? So let’s actually scrutinise whether the Coalition government has delivered as champions of free speech. At the start of 2014, we saw the PM criticise the ABC, interfering in the freedom of speech sustained by the organisation’s statutory independence. Even more disturbing was his line of argument. He described their news coverage on asylum seekers as ‘unpatriotic’, that the ABC “appears to take everyone’s side but our own”. Amidst intra-party disagreement, Abbott also took a shot at independent journalists and whistleblowers, and even the ABC’s fact-checking unit. There’s also their stance on an important type of freedom of speech – academic freedom. In 2012, Julie Bishop as shadow Foreign Affairs Minister said she would gut funding from any academic or academic group who supported the BDS campaign, a position criticised by prominent Jewish Australian academics as “an attack on academic independence, free speech and democracy”. And near the end of the 2013 election campaign, Shadow Treasurer Joe Hockey attacked ‘wasteful research’ and the ARC’s statutory authority to make independent decisions about where grant funding is allocated. After the election, the Coalition ‘redirected’ $103m in Australian Research Council funding into specific health areas through the December 2013 MYEFO (Mid-Year Economic and Fiscal Outlook). We might well ask, if we exclude public institutions like the ABC, the ARC, and Australian academics, who other than Andrew Bolt is being permitted greater freedom of speech? You can’t have section 18C without 18D. As argued by Bibhu Aggarwal the sections are a balancing act that needs to be read together. When this is done, as Justice Bloomberg did in the Bolt case (Eatock v Bolt  FCA 1103), (a) the onus of proof falls on a respondent; and (b) the test is whether the conduct was done “reasonably and in good faith”. Taking into account a fairly insipid debate about whether the test is objective or subjective (or both as the provision actually reads), Bloomberg decided the ‘fair comment’ exemption was not available to Bolt because of the inclusion of untruthful facts, the use of inflammatory and provocative language and his failure to minimise the potential harm to those likely to be offended. In the context that Andrew Bolt suffered what may be accounted for as a humiliating defeat by Pat Eatock et all, let’s acknowledge that this is the real and only reason why reforms are being proposed. After years in which racial vilification laws have floated around, Abbott and Brandis’ reform agenda is directly attributable to the Bolt case. Brandis reiterated this on a recent episode of ABC’s Q&A. Though the PM has been able to largely escape public scrutiny, The Australian reported last week that amongst party room colleagues, he had made, “a firm statement opposing racism but in favour of free speech and amending legislation to prevent a repeat of the 2011 judgment against the popular columnist and broadcaster”. It is slightly disingenuous for the Coalition to claim it is aggrieved by political censorship. They have demonstrated that political censorship is fine – except when it is forced upon certain individuals. Insofar, the debate is not so much about Abbott and Brandis defending ‘our’ freedom of speech, but the right of influential media men to be less accountable for what they do. Abandoning s18C is actually about the political economy of racial discourse, or in other words, about expanding the capacity of powerful interests to profit from verbalising minority groups who cannot speak for themselves, either because they do not have articulate enough advocates or because big media will always discount or silence their views. We have seen what the media can do to political parties and politicians exposed to the public spotlight. The problem is that the Coalition Government is set to unleash these forces, including those with an inherent interest in profiting from racial vilification, upon everyday Australians. We may just see the Blainey debate, the Hanson One Nation years, Jones’ contribution to the Cronulla Riots, and other intermittent attacks on Muslim, African and Asian Australians pale in comparison in the years to come. When the legislation comes (it now looks like mid-year), everyday Asian Australians should think well and hard about who will bear the social cost of these changes. Selective communication by the Immigration Minister Scott Morrison on refugees, deregulation through the Commission of Audit and Repeal Day – the Coalition government already have a problem with accountability. Will Tim Wilson or John Roskam care if you or I identify less strongly as Australian citizens? Or if you face more incidents of racial intimidation on the bus or at the footy? Conservative forces have vastly more to gain from a more assimilative and intimidated polity. If more Asian Australians saw themselves as outsiders to the aspirations of Australian democracy this would simply mean that conservatives had less interests to balance. Section 18C racial vilification reforms should rightfully be portrayed as an attempt to allow the noisiest and angriest voices in the public arena greater scope to weaken social cohesion, to deflate a dispirited civil society. Keep in mind that this is an attack on the laws that ensure we communicate with one another in public spaces without distortions and lies, and with some kind of net that ensures a modicum of tolerance and respect. For Tony Abbott, a man who declared at the start of the 2013 election campaign that, “I make this pledge to you the Australian people. I will govern for all Australians”, we may well ask about the kind of Australia he intends to lead.